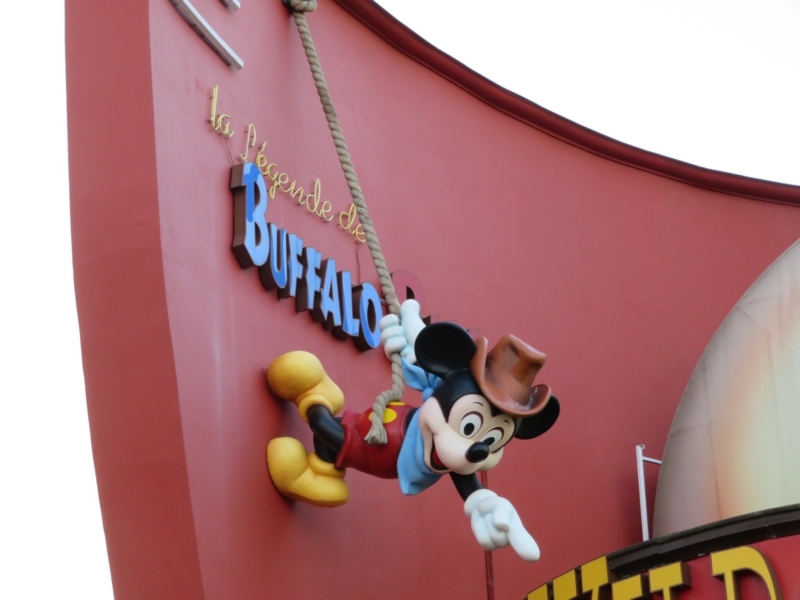 With two theme parks, Disneyland and Movie studios, it is best to visit for more than one day. Even smaller children can get the a lot out of their visit. The biggest bonus for us was that Febe, who just reached 1m20, could go on every ride, apart from the Indiana Jones coaster. 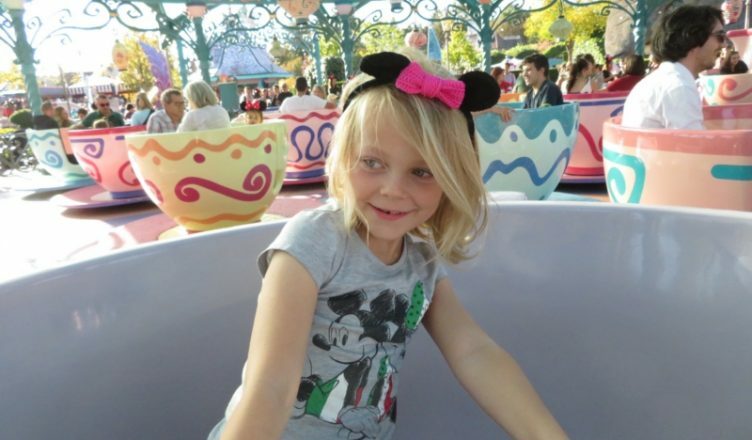 A lot of fast & serious rides for her available at Disney! Another added bonus is the Magic Hours you get with staying on site. The park opens up two hours early for hotel residents, and for people who payed extra to get in early. The closest, but most expensive Disney hotel: right at the entrance! A little hint on Magic Hours: we found out that there’s a lot you can do in Movie Studios during that time. Be sure to run to Crush’ coaster as soon as the gates open. This very popular coaster has no fast-pass system (more about that later) and is hugely popular throughout the day. Since Movie Studios closes earlier than Disneyland, you don’t have the late hours benefit (more about that later). We found ourselves 10 minutes after opening at Crush’ coaster to see a whopping waiting line of 90 minutes. During Magic Hours! If you’re staying for more than two days, there are more budget options of staying around the parks. Check booking.com for your options, for instance. More than two days means more time to do all the attractions, and so it’s not that bad if you arrive at normal opening hours, or go to your hotel a little earlier in the evening. Disney is not cheap. Face it, for most of us this is not a yearly excursion. We took sandwiches in for lunch on the first day and even brought our own breakfast for the next morning – to save a few €. The park entrance fee and hotel fees are high, and you should expect to pay around €15 per person for the cheapest meals in the parc. 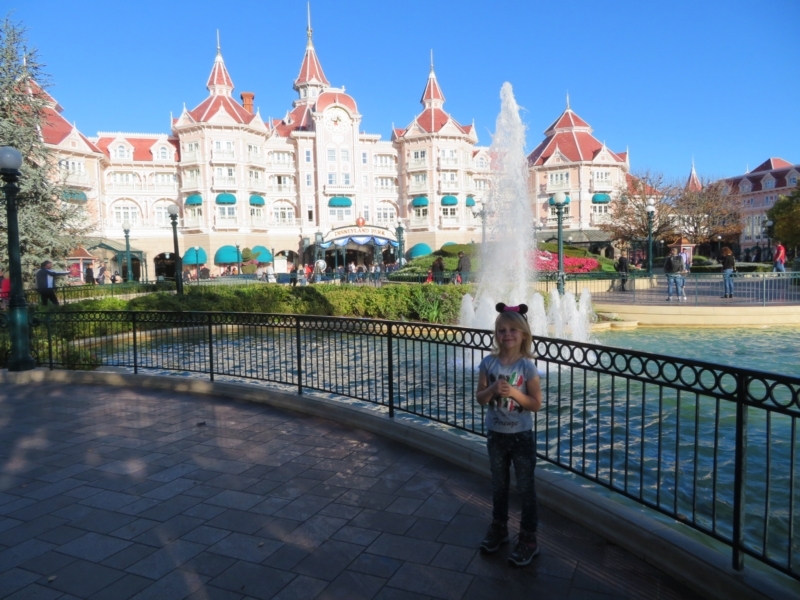 If your kids are not too small and you can manage the extra walking distance, meals in Disney Village (just outside the parc entrances) are a bit cheaper. In the evening cheaper dining options get fewer, because both Movie Studios and Phantasialand (in Disneyland) close early (when we were there 18.00 PM and 19.00 PM). That means all restaurants there close as well. A huge dissapointment for our girl, who insisted on fish & chips in Phantasialand. Yup, even in Disney not all is perfect! Restaurants are cheaper in Disney village, just outside the parks. Ofcourse, while there, you want to get the most out of your day and do as many rides as possible. You MUST use the fastpass system, but do it wisely. You can only get 3 passes each day, on busy days sometimes even only two. Get a fastpass for one of the rides that have them as soon as the park opens, and get your second (of third) pass as soon as your timeslot allows it. – after 3 hours you can take another fastpass. Do that as soon as you can. We found it best to go for a fastpass for Big Thunder Mountain and Peter Pans Flight in Disneyland, and for Ratatouille in Movie Studios. Those rides are busy the whole day long. Disney created an app that shows you the current waiting time for each ride. A great system, but we found that the app is often wonky. That means that you suddenly don’t see any waiting time anymore, and you have to re-install the whole thing. We hope they can fix that bug soon, because if it works, it’s a bliss. You do have to run around a little more to get to a ride that suddenly drops under 45 mins waiting time (which, in Disney, is short), but it’s worth it. 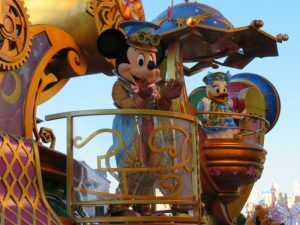 Another trick is to wait to do more popular rides in late hours or during the parade. 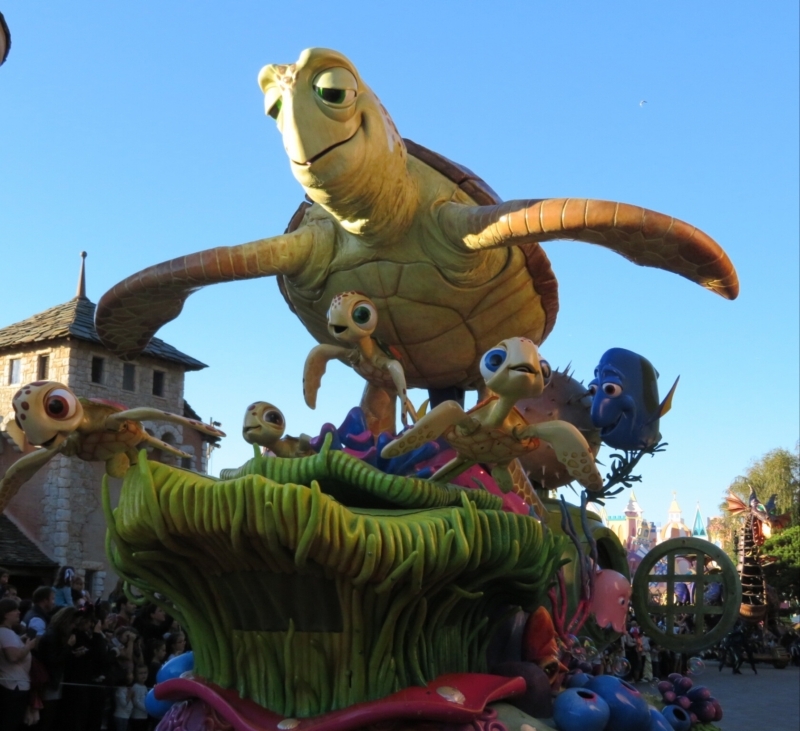 The parade is a must see, but you don’t have to see it twice. A lot of people watch the parade, so you can benefit and go on some rides at that moment. We also found that popular attractions for kids, for instance Buzz Lightyear, are not crowded anymore after 20.00 PM. The same applied for Indiana Jones, actually. The parade is a must-see! About the waiting times, they always seem to be rather accurate. Often you have to wait a little less (5-10 minutes) than indicated, we never had to wait longer. At Crush Coaster Disney developed a game you can play for free on your Phone or tablet during your waiting time, which was a huge hit with Febe. It works through a wifi-signal, that only works when you’re in the line there. It would be great if Disney decided to create more apps like that, to keep children entertained during the often long waiting times. And maybe they should invest in Wifi as well, which only seems available at certain parts of Movie Studios for the moment. As we mentioned before, the parades are a must-see. You have several smaller parades you can watch during the day and one bigger parade in the afternoon. If you are there for more than one day, it really is something you can’t skip. Just check out this video we made during it! During my previous Disney visits, there was a parade with lights in the evening as well. 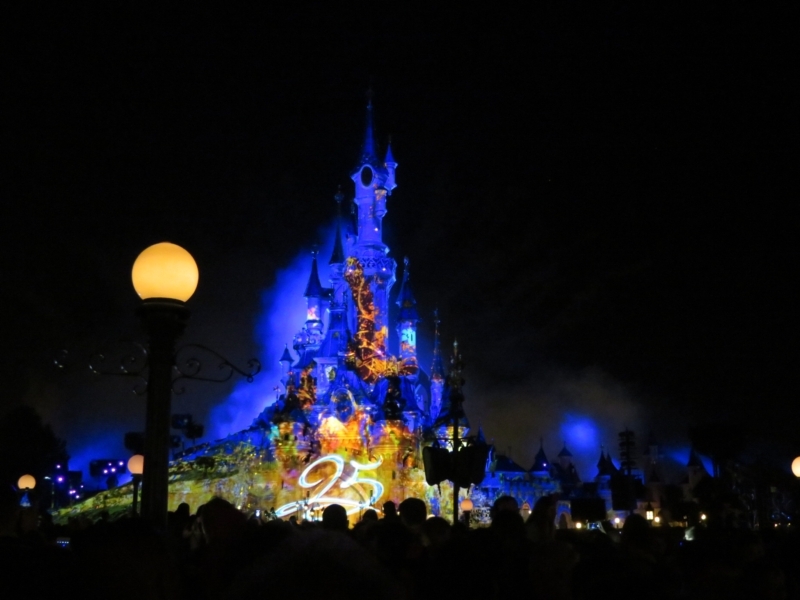 During this year, the celebration of 25 years Eurodisney, they switched it to a spectacular illuminations show, with animations shown on the castle, completed with Disney theme music, fireworks and a fountain show. Just the perfect ending of your day in the parc! There’s so much to do and see… but we’ve tried to list our 3 favourite things! No doubt in our mind – that’s the best ride in the park, for all 3 of us! It was a long wait, but it was really worth it! It’s hard to pick just one thing there. 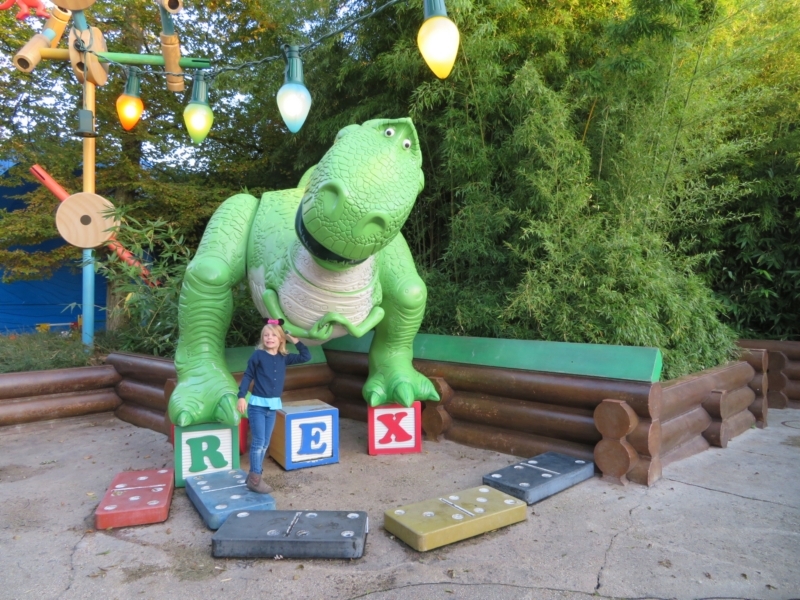 The whole area is stunning and full of attractions our girl loved. 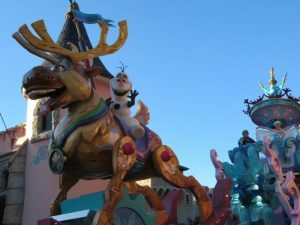 We wish you a very magical visit in Disneyland Paris, and hope this post was usefull. Let us know how it all went in the comments below 🙂 We love your feedback!